Whether you aspire to stand on certain summits or to master a specific set of climbing skills, we at Berg Adventures take your quest seriously. Our goal is to serve as your personal mountaineering coach as you pursue a lifetime of mountain adventure both in the hills and crags close to your home and in ranges around the world. Your development as a mountaineer involves learning a craft. With Berg Adventures, you will learn the history of basic climbing skills and techniques and practice them in the spectacular high altitude environment of Huayna Potosi, Bolivia. The knots, techniques and equipment we teach and use are universal standards. You can climb in any climbing area, mountain range, — or rock gym, for that matter — once you have mastered them. This course will give you the basics to make climbing a lifelong activity, from hill walking and peak bagging to climbing rock and ice and traveling on glaciers as you take on the challenges of the alpine environment. Once climbing is in your blood, you will not stop with a list of peaks or goals; the mountains will continue to teach you as long as you visit them. Berg Adventures courses strive to provide you with the prerequisites to “get back into the classroom” anywhere you might choose. The Bolivian Andes offers some of the most alluring climbing we know of anywhere in the world. Rising to elevations between 13,000ft/4000m and 21,000ft/6,500m feet, western Bolivia’s massive glaciated peaks and the surrounding altiplano (high plains) feature cobalt-blue skies and remarkably stable weather. Located just 16 degrees south of the equator, these high peaks provide superb and seemingly endless opportunities for alpinists and hikers. What better place to learn? 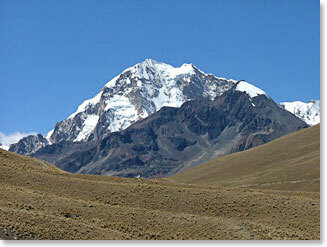 We will spend our time learning on Huayna Potosi, just 25 km north of La Paz, Bolivia’s capital city. 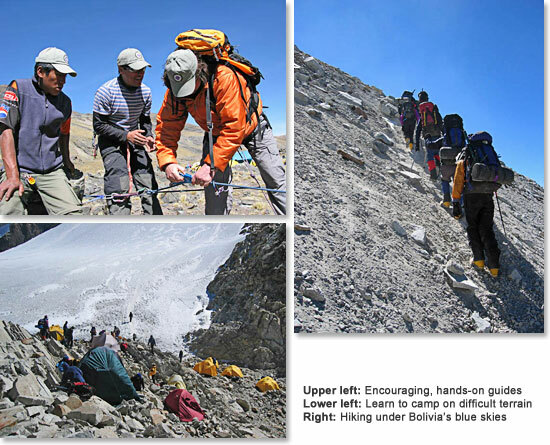 From our base camp, we will have easy access to steep pitches and glaciers to learn and practice our new skills. 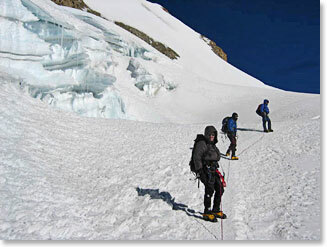 If weather and conditions cooperate, we will finish the course by summiting Huayna Potosi at 19,974ft/6088m. Participants are encouraged to continue on to our full Bolivia climbing program with a visit to the Condorri Range to climb a number or exciting and challenging peaks that will put your new skills to the test. In addition to the beautiful mountains, the culture of Bolivia is fascinating, with the highest percentage of indigenous people in the western hemisphere. Many of the Aymara and Quechua people, living in the remote areas, do not speak Spanish. Yet in La Paz, there is a colorful mix of modern and traditional, European and ancient Andean cultures. Berg Adventures courses are physically demanding. We highly recommend that you develop a training program that is related to the activities you will be performing in the mountains. The goal is to develop cardiovascular endurance as well as your overall muscle strength. You want to focus on specific muscle groups that are related to climbing activity. If you are in excellent condition, this will certainly have a positive effect on the quality of your experience. In other words, the more fit you are the more fun you will have. Use your course as motivation to start training today! View our previous Bolivia Mountain School dispatches.